AND CUSTOM T-SHIRTS FOR ALL AGES! Printsome is a t-shirt printing agency reinventing the printing industry with their top of the line customer service and custom printing advice. 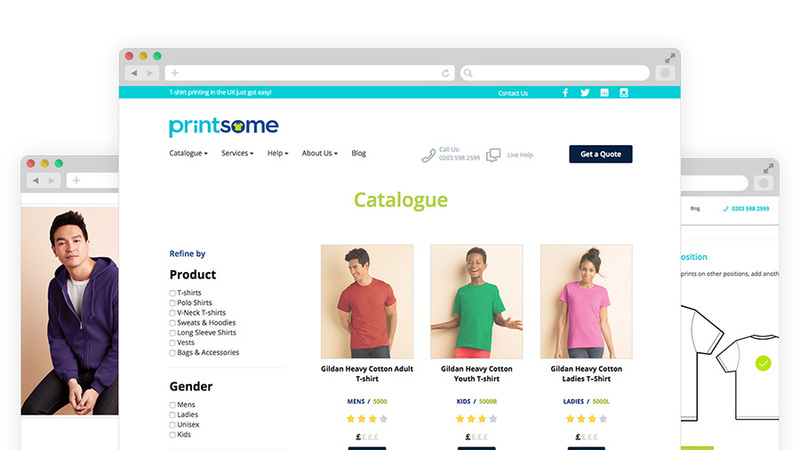 From personalised polo shirts to screen printed t-shirts, Printsome is here to make things easy for you. Personalised kids t-shirt printing is perfect for those mothers looking to get their children a more personal gift. Not only can you get a very comfortable screen printed t-shirts but also kids personalised hoodies for the winter. It is always a difficult task to find personalised kids & childrens clothing that are the right size but with our wide range of kids printed t-shirts you are sure that you will find whatever custom clothing you are looking for. Personalised childrens t-shirts are perfect for any of the printing techniques that we have, including dtg, embroidery, screen printing, or transfer printing. With our wide range of products featuring Gildan, Fruit of the Loom, B and C for ages all the way from toddlers to teenagers, you won’t have trouble choosing the perfect garment for personalised clothing. For more help on any of the printing techniques, our helpful printing advisors are more than happy to explain direct to garment printing or vinyl t shirt printing. We can also help if you are looking for personalised hoodies for children or custom embroidered polo shirts. Cambridge, Belfast, Cardiff, or Wolverhampton, you don’t have to worry, because we are an online t-shirt printing agency delivering across the UK. Even if you have a tight deadline we can help you out with express t-shirt printing.